Italy has 51 total sites included in the list of World Heritage Sites making the country the first of the world. Don’t miss the opportunity to discover the iconic classics and the hidden treasures of Italy. Go for the classics and go for the unknown. An extra-ordinary itinerary off the beaten path that will leave you breathless. 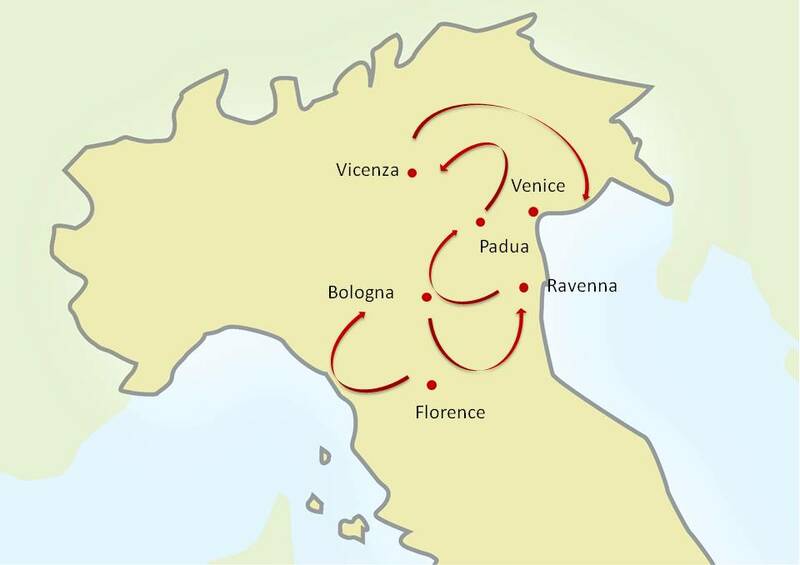 The tour features Florence, Bologna, Ravenna, Padua, Vicenza and Venice. Live the unique opportunity to enjoy some magnificent and little-known views over Florence from the secret pass hidden by the Pontevecchio, the famous Vasari Corridor: the idea of entering an inaccessible, almost mysterious place makes the visit to the Vasari Corridor thrilling and intriguing. Have a nice walk in the city cradle of the Renaissance and admire the famous works of art of great artists at the Accademia and Uffizi gallery. Taste the real essence of Bologna, the main city of the Italian Food Valley, homeland of Prosciutto and Parmigiano cheese and discover the art treasure of the city where the first university of the world was funded. You will love Ravenna: a small city rich in art and history, a real hidden treasure. Its UNESCO World Heritage Sites will leave you breathless. The Scrovegni Chapel is Padua's most famous sight, a remarkable cycle of frescoes completed in 1305 by Giotto. Discover the equilibrium and measure of Andrea Palladio, an architect with a extraordinary sense of proportion and spatial relationships. Along the roads, half-hidden, behind rich vegetation, often not seen by the hurried traveler, the are many buildings reminding the past times when living and spending hours at home and in the country meant intense pleasure: the villas of the province of Vicenza. Some of them of incomparable splendor, others of modest make, some perfectly restructured in their original beauty, others neglected and weather-beaten, constitute the original diversity of the Province of Vicenza. 9 Nights accommodation in exclusive and fascinating 4 stars sup. Hotels or Historical mansions, with full buffet breakfasts: 3 Nights in Florence, 2 Nights in Bologna, 1 Night in Ravenna, 2 Nights in Padova, 3 Nights in Venice. Private sightseeing Tours with expert local English speaking guides in Florence (Accademia Gallery) – Bologna (Teatro Anatomico) – Ravenna (Mausoleo di Galla Placidia, Basilica di San Vitale, Basilica di Sant’Apollinare in Classe) – Padova (Cappella degli Scrovegni) – Vicenza – Venice; including all the entrance fees to the sites visited avoiding long waiting lines. Small group guided tour in Florence of Uffizi & Vasari Corridor led by a local English speaking guide. Private Boat Tour on the Grand Canal in Venice with English speaking Guide. Train Florence – Bologna: 1st class tickets and seats reservation. Train Bologna – Ravenna – Padova. Train Padova – Vicenza a/r : 1st class tickets and seats reservation. Train Padova – Bologna: 1st class tickets and seats reservation. Private transfer by van with English speaking driver from the airports. Private transfer by van with English speaking driver from the hotel to the train station in Florence and Bologna. Private transfer by van from the train station to the hotel in Bologna and in Venice. Tour begins in Florence and ends in Venice. Florence highlights in a 3 hours private walking tour: explore the capital of Tuscany, cradle of Renaissance art, one of the most important art cities in the world. The tour will end at the Accademia Gallery, famous for its sculptures by the great Renaissance artist, Michelangelo: above all, the magnificent statue of David draws thousands of visitors. Join a small group tour to visit the Uffizi Gallery, a must-see destination with its large collection of works of art by great Italian artists such as Botticelli, Giotto, Cimabue, Michelangelo, Leonardo. The building of Uffizi complex was begun by Giorgio Vasari in 1560 for Cosimo I de' Medici to accommodate the offices of the Florentine magistrates, hence the name uffizi, "offices". The architect also built the famous Vasari corridor: a secret a passageway that the family Medici use to move freely from the residence (Palazzo Pitti) to the government palace (palazzo della Signoria, other side of the river Arno). One of the most astounding architectural masterpieces of the Renaissance, the corridor is rarely open to the public: take advantage of this unique opportunity to enjoy some magnificent and little-known views over the city from its windows as to admire one of the greatest collections of portraits and self-portraits in the world, over 1000 paintings, dating from the 17th and 18th centuries by some of the most famous masters of painting. Walking tour with your private guide in the capital of Emilia Romagna, an important cultural and artistic centre in terms of landmarks, a varied mixture of monuments and architectural examples (medieval towers, antique buildings, churches, the layout of its historical centre) plenty of works of art bearing witness to the cultural importance of the main city of the region over the centuries. You will also discover the reason why Bologna is the homeland of good food: hand-made pasta (tortellini, lasagne, ravioli, tagliatelle) and ragù alla Bolognese. Visit Ravenna, location of eight UNESCO World Heritage Sites with a local guide and experience the magical ambience of its Basilicas and Mausoleums. Visit the marvelous and perfectly preserved golden Paleo-Christian Byzantine mosaics and Dante’s Tomb. An imperial Byzantine stronghold in Italy, Ravenna experienced a period of splendor and wealth until the 8th century. A fusion of the artistic influences from the Orient with Christian iconography, with splendid internal gold mosaics. This heritage also represents proof of the relationships and religious and cultural exchanges during an important historical period of European culture. Discover the picturesque old town of Padua with its medieval squares, churches and architecture with a private local guide. You will visit the Anatomical theatre, the first permanent structure of this type in Europe; and the Scrovegni Chapel, a masterpiece in the history of painting in Italy and Europe in the 14th century, considered the most complete series of frescoes executed by Giotto in his mature age (1303-1305). Private guided tour of Vicenza, a thriving and cosmopolitan city with many museums, art galleries, piazzas, villas, churches and elegant Renaissance palaces. You will visit the beautiful 16th century villas, designed by Andrea Palladio. One of the best examples of human inventiveness: a prestigious sign of the munificence of a few great families matched with the technical skills of artisans whose work, together with the genius of the great architect. With the Palladian Villas of the Veneto in the surrounding area, and his renowned Teatro Olimpico (Olympic Theatre), the "city of Palladio" has been enlisted as UNESCO World Heritage Site since 1994. Private walking tour of classic city highlights combined with the hidden Venice to appreciate the unique city architecture out of the most crowed areas. Discover the genesis of Venice, its development as a City State and its economical rise during the Middle Ages and the Renaissance. One hour on a private water taxi along the picturesque maze of minor waterways and the impressive Grand Canal with your private guide to explore the city by boat. 3 hours walking tour of Cannaregio, the northernmost of the six "sestieri" (neighborhoods), yet to be discovered by mass tourism. Explore this pristine part of the city passing the colorful open-air market and the Jewish Ghetto: admire the façades of the five lavishly decorated Baroque-Rococo Synagogues, the famous Palace of the Camel and the church of la Madonna dell'Orto which hosts canvases by Tintoretto (the painter was actually buried here).